Thank you to the entire community for all the support and encouragement. It's awesome to have the opportunity to compete at the games but as athletes we are not the community. It's the people in the gym every day that continue to bring in others and meet them where they are, and change their lives through CrossFit that make up the community. THAT is what CrossFit is about, not competition. Chris, yet again another great performance. I have to admit, i wish you had won the CF 2011 finals. It would have been a hugely popular win within the CF community. In some ways, you really are the real deal, are true winner in more ways than i can count (and i have a math degree!:)). I have been part of the CF community for a little over 6 months now. One of the first lectures i received during my induction classes was that to learn a technique, to draw inspiration, value friendship, respecting everyone around you, voicing encouragement, and the list goes on......, was to 'google' a certain Chris Spealler. I am absolutely sure there are thousands of budding CF's out there who draw inspiration from your achievments. Your trip India was so memorable to watch. It showed how you are so easily able to reach out afar and breakdown barriers. Its a credit to your upbringing Chris, plain and simple. I hope you make a trip to England in the not too distant future and grace us with your presence at CrossFit West Yorkshire. It will indeed be an honour amongst us to have the legend of the CF Community, one who has no equal. May GOD Allmighty bless you with good health and prosperity. Good luck for the remainder of year and maybe, just maybe, we may see you across the pond. Good Job Chris, it is always a pleasure watching you compete. Your dedication, commitment, and consistency is unparalleled in this community! G-d bless you brother! I am a former wrestler and a current United States Marine, I just wanted to let you know how much of an inspiration you are to me. You are an incredible competitor, and it is a privilege to watch you grind it out day in and day out. If i could chose any crossfiter to emulate it would be you, thank you for your dedication to the sport and the example that you set for the rest of us. Good luck at the games. I just started crossfit the beginning of the year and ive seen some of your wod work outs. Your a great inspiration. From one wrestler to another, let's show them we are the toughest!!!! Good Golly, thats a strong score. You're an incredible inspiration to us all! 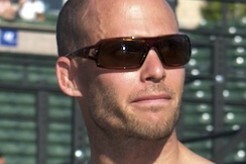 I want to be Spealler strong!